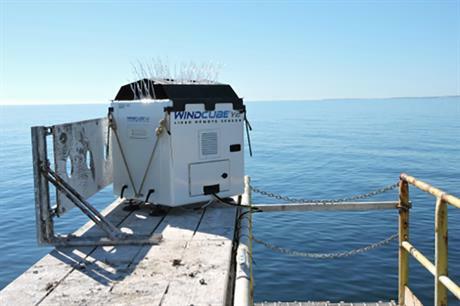 UNITED STATES: A WindCube vertical profiling lidar has been installed off the US north-east coast to improve wind resource data. Renewable NRG Systems provided the lidar to the Woods Hole Oceanographic Institution (WHOI). It was installed at WHOI's coastal observatory, 3.2 kilometres south of Martha's Vineyard. The campaign forms part of the Massachusetts Clean Energy Centre (MCEC) metocean initiative, which works to "advance planning and permitting" of offshore wind in the north-east US region. "The collected data will be used for validation and improvement of existing wind models, [and] to increase industry and regulatory confidence in the value of the wind resources off Massachusetts and Rhode Island," said consultancy AWS Truepower, which is also working on the project. The lidar could also be used to compare data from floating lidars that could be deployed at the wind energy areas off Massachusetts. Dong Energy and OffshoreMW are developing 1GW-plus zones off the coast of Massachusetts, following competitive tenders. US developer Deepwater Wind is also trying to start two major projects off the north-east US coast.